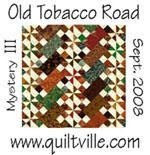 I have been working on Bonnie Hunters Thanksgiving mystery. She used greens, reds, gold and tans. I didnt have many greens, and was not going to buy any, so I changed it to blues. I love it. At first I thought it was going to be too busy, but it is just right. Leave it to Bonnie, she gets it right. I still have to do the border. 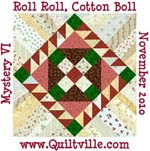 Bonnie made a pieced border, but I might do a plain border. I will think about it. Maybe a narrow of gold and then red?? I sure dont know tonite. LOL. I love the colors that you chose. 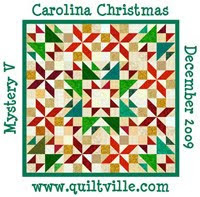 I am at the same quandary as you, pieced or solid border? I'm waiting until after the Holidays. This is gorgeous! I've put mine aside until January, but I love looking at everybody elses. Wow...it's terrific! I hope to catch up to you after Christmas!